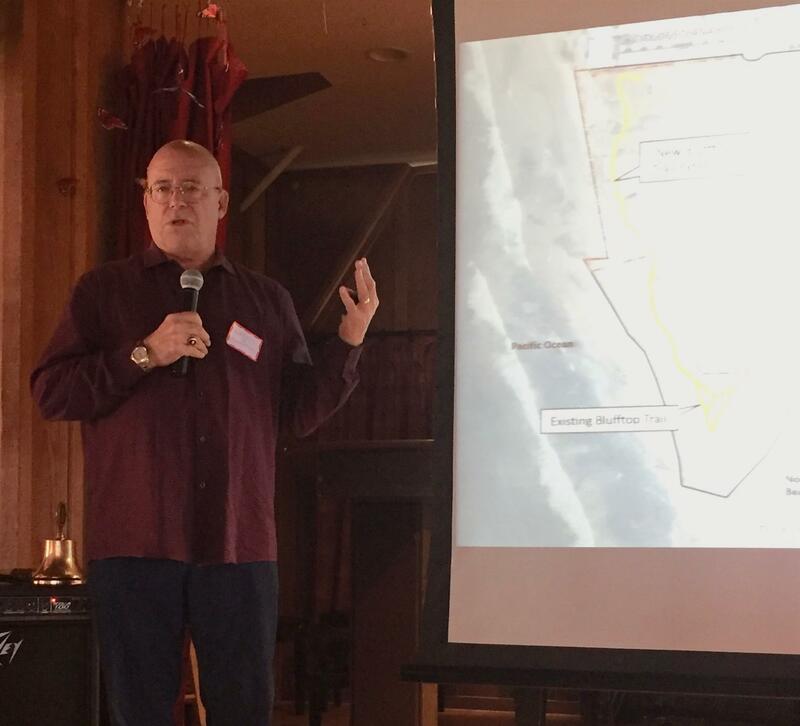 Jim McMenamin, Senior Vice President of Forward Planning for Zephyr gave the presentation at our October 25, 2018 meeting on plans to develop the property to the north of North Beach (aka Dog Beach) in Del Mar. For nearly a century, the bluffs above Dog Beach were mainly privately owned. Now, plans are in the works to develop the property to create what Zephyr refers to as a “Resort without walls”. Visitors to the Montage in Laguna Beach will get a glimpse of the type of development Zephyr envisions: a 251 room hotel, 76 resort villas, four restaurants and a trail network along the bluffs for the public to enjoy. Just over one quarter of the site will be occupied by the Del Mar Resort, and the remainder will be open space that preserves view corridors. The profile of the buildings will be limited to no more than 46 feet in height to preserve site lines. All parking is to be self-contained and will not impact street parking. The revenue from the property to the City of Del Mar- largely through transient occupancy tax (TOT)- is estimated to be around $7 million annually, or nearly 1/3 of the current city budget. Jim explained that Zephyr has coordinated extensive outreach activities to gather public input and ensure that concerns are addressed. Project completion is anticipated for 2022 and Zephyr put significant effort into developing the project in an environmentally sustainable manner to provide area residents with a new site to gather to enjoy the benefits of this unique space.